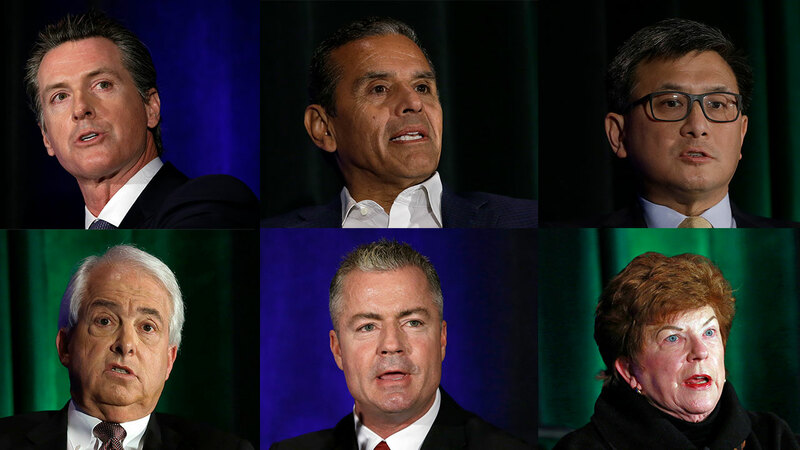 SAN JOSE, Calif. -- The six leading candidates for California governor discussed housing, immigration, gas taxes and other issues at a debate Tuesday ahead of next month's primary. Democrats pledged to stand up to Republican President Donald Trump and provide help to the homeless while Republicans said they'd cut taxes and regulations and fight "sanctuary" policies on immigration. Gov. Jerry Brown signed a law last year restricting when law enforcement agencies can cooperate with federal immigration authorities. "This is federal law," said John Cox, a Republican businessman from San Diego. "This is like George Wallace standing in front of a school house in Alabama and saying he's not going to respect federal law." Democrats said the state must stand up for young people who were brought to the U.S. illegally as children. "I think we need to acknowledge that the Dreamers didn't come here on their own," said Democrat Antonio Villaraigosa, the former mayor of Los Angeles. "They came here because their parents brought them here, and we've got to say that they have a right to have a legalized status." Children brought to the country illegally are commonly referred to as "Dreamers," based on never-passed proposals in Congress called the DREAM Act. All the candidates are on the same ballot in the June 5 primary and the top two, regardless of party, advance to the general election in November. Polls show Democrat Gavin Newsom with a commanding lead, and the contest has become a battle for the second slot. With millions of mail ballots already on their way to voters, time is running short for the candidates to win over new voters. Some of the sharpest exchanges were between the two Republicans, who are fighting over a smaller share of voters in a state where Democrats dominate. They sparred over the gas tax, each presenting himself as the strongest opponent of a 12-cent-per-gallon increase approved last year by the Legislature. It got personal at times, with Assemblyman Travis Allen twice calling Cox "angry." Allen repeatedly threw out red meat to conservatives, noting that he was the only candidate who voted for Trump and urging a purge of "Bay Area liberal elites" working in state government. Cox said he regretted voting for Libertarian Gary Johnson and called for getting rid of "leftist propaganda" in schools. "I wasn't sure (Trump) was a conservative. Now I know. He's a conservative," Cox said. In one of the debate's most tense exchanges, Allen referenced an affair Newsom had with a city staffer while he was mayor of San Francisco. The woman was married to Newsom's friend and adviser. "If you can't trust Gavin with his best friend's wife how can you trust him with your state?" Allen said. Newsom shot back: "It's hard to hear from Mr. Allen - who's a devout supporter of Donald Trump - about sexual harassment." Newsom and Villaraigosa - who also faced an adultery scandal while he was mayor of Los Angeles - said they learned and grew from the incidents. "I made a mistake. I lost my marriage. I lost my family for a time," Villaraigosa said. "I took responsibility for it. My whole life I've taken responsibility for my actions." Allen, meanwhile, dismissed a sexual harassment complaint filed against him as a minor issue ginned up by Democrats. The debate was televised statewide and moderated by Chuck Todd, host of NBC's "Meet the Press." It was perhaps the last best chance for candidates trailing Newsom to break out or change the dynamics of a race that has played out largely under the radar as California's elected leaders focused on fighting Trump's agenda. Newsom has declined all other debate invitations ahead of the primary. An April poll by the Public Policy Institute of California showed Newsom supported by 26 percent of likely voters. Cox was second at 15 percent, followed by Villaraigosa at 13 percent and Allen at 10 percent. Democrats John Chiang and Delaine Eastin were in the single digits while 22 percent of voters said they were undecided in the survey of the 867 likely voters. The poll had a margin of sampling error rate of 4.4 percent.